I’m so struck by this quote. It’s about resiliency. I have often felt ruined. Ruined by what’s happening in my world. Ruined by my thoughts, my feelings, my sadness, my struggles, my anger, my fear. Ruined by things that have happened to me and haven’t happened to me. Ruined by things I wish would happen, but haven’t happened. Ruined by hopelessness, despair and depression. Ruined when I choose to play the victim, when I choose sadness and when I choose fear, when I choose pessimism. Or ruined by hard, scary and unfortunate things that just seem to happen in my life. And in that hope, even if it’s just a sliver, there’s a sense that perhaps a treasure can be found or will be found and that things can get better or will. 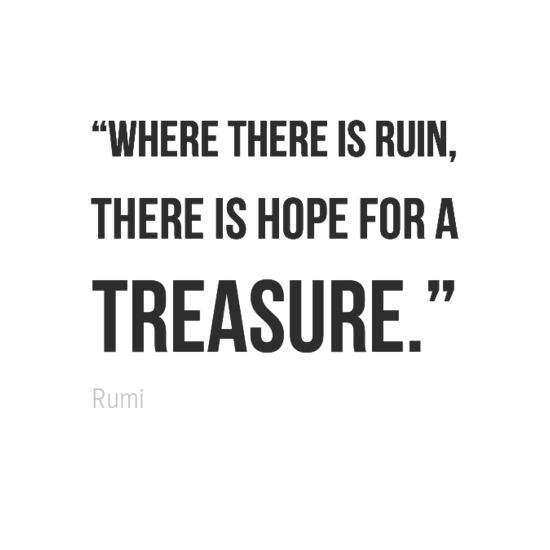 And as Rumi said before her, holding out hope for all of us in the struggle, in the dark night of the soul or in whatever darkness or destruction we are facing a treasure can be found. So, in some way I want to live a ruined life. Ruined in the eyes of the world. Ruined in the eyes of the ego. For ruin has a way of stripping away of all that is false so that I can come to what is true and real – to know the truth that sets free. So I don’t need to be afraid of ruin – the ruin and despair of the world or even my own. For it may just be the pathway I need to walk, for a brief time, in order to discover the treasure. The treasure that has to do with God, with love, with trust. And in that discovery and finding of it, never to be ruined again but born anew, becoming more resilient, alive, flourishing and free.